Japanese troops enjoying leave in Saigon during World War II. The Japanese occupied Vietnam in September 1940 and remained there until the end of World War II (August 1945). The pretext for the invasion was Japan’s ongoing war with China, which began in 1937. By occupying Vietnam, Tokyo hoped to close off China’s southern border and halt its supply of weapons and materials. The occupation of Vietnam also fit into Japan’s long-term imperial plans. Japanese leaders, driven by militarism and hungry for profit, dreamed of creating what they called a Greater East Asia Co-Prosperity Sphere, an economic coalition of Asian nations. Together these Asian countries would expel Western imperialists and capitalists, then share trade, resources and commodities between themselves. In reality, the Co-prosperity Sphere would be a quasi-empire, run from Tokyo for the benefit of Japan, its government and its corporations. Countries like China, Korea and Vietnam would be transformed into vassal states ruled by puppet governments. They would provide cheap land, labour and resources for Japanese industries. It was Japanese imperialism cloaked in a veil of Asian nationalism. 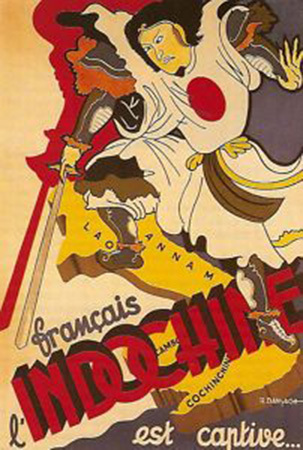 From early 1940 Tokyo began pressuring French colonial administrators in Vietnam, demanding that Japanese soldiers be allowed into the country to secure the Chinese border. These requests were refused. In May 1940 soldiers from Nazi Germany invaded France; within a month the French government had surrendered and signed an armistice with Berlin. 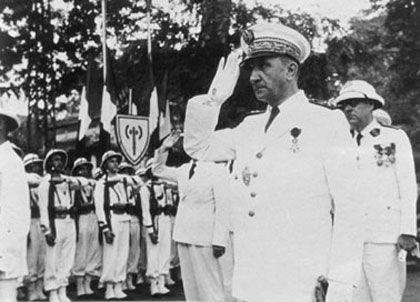 The French surrender at home weakened the French colonial government in Vietnam, which had little option but to concede to Japanese demands. An agreement signed in June 1940 allowed Japanese troops to control the northern border between Vietnam and China. Another, signed in August, acknowledged Japan’s rights and interests in south-east Asia. On September 20th the French governor-general, Jean Decoux, signed an agreement with Tokyo giving the Japanese access to Haiphong harbour and allowing the placement of up to 6,000 troops in northern Vietnam. But the Japanese, dissatisfied with this agreement, broke it the following day. By midnight on September 22nd a Japanese invasion of Vietnam was underway. Japanese forces took just a week to secure control of Vietnam. By October there were around 10,000 Japanese soldiers stationed there, mainly around the ports, airfields and important industrial centres. For most of their occupation, the Japanese left the French colonial government in place, though its authority was greatly diminished. This tactic contradicted Tokyo’s policy of “Asia for Asians” – but Japan could not spare the men for a full-scale occupation of Vietnam. Instead, they preferred to leave the French in charge and develop Vietnam as a client state. This allowed Tokyo to ‘use’ Vietnam for its own ends without deploying large numbers of soldiers there (at no point did Japanese troop numbers in Vietnam exceed 35,000 men). 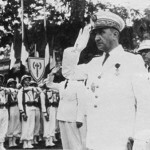 Between 1941 and 1945 the French administration in Vietnam, led by Decoux, engaged in ‘co-existence’ with the Japanese. In May 1941 Decoux granted Japan ‘most favoured nation’ status, meaning the bulk of Vietnamese exports were allocated to Tokyo at low prices. Later, Japanese troops were given unrestricted access to Vietnam’s roads, rail network and ports. This allowed them to use Vietnam both as a thoroughfare for the conquest of Thailand and Burma, and a staging point for attacks further south. The Vietnamese people had mixed feelings about this dual imperialism. Some welcomed the arrival of the Japanese: they believed an Asian colonial power was preferable to Westerners. Two notable Vietnamese religious groups, Cao Dai and Hoa Hao, openly collaborated with the Japanese. 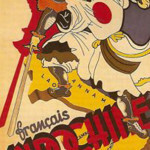 Others, however, considered the Japanese to be no different to the French, just another troupe of foreign imperialists. 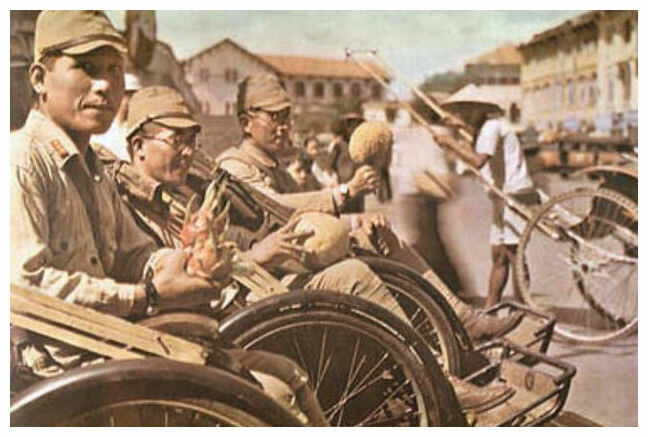 The Japanese made an effort to win the hearts and minds of the Vietnamese – a policy that differed from their brutality and oppression in China. Propaganda told the Vietnamese that the Japanese were in their country as “liberators” rather than conquerors. Japanese language courses were organised in large cities; Japanese films, literature and poetry were translated into local languages. The Vietnamese people were told how Japan’s military supremacy was slowly driving the white imperialists out of Asia. But while some Vietnamese drew closer to the Japanese, most believed Japanese imperialism would be the same, or even worse, than that of the French. One peasant told his neighbours that “The Japanese are a hundred times crueller than the French. Even a worm or a cricket could not live under their brutal violence”. The Japanese presence in Vietnam also attracted foreign attention, particularly from the United States. In 1940 America was not yet at war with Japan but it was nevertheless working to restrict Japanese expansion. The US also wanted to protect its imports of raw rubber, half of which came from Vietnam. At first, Washington backed the French colonial regime in Vietnam, hoping it would resist Japanese overtures. But when the French caved into Japanese demands, the US changed tack. By 1943 president Roosevelt was openly talking of Vietnamese independence. By 1944, Washington was much more interested in the situation in Indochina. The Americans opened a military station at Kunming in southern China, while American advisers and Office of Strategic Services (OSS) agents supported both the Chinese Guomindang and Vietnamese resistance groups. 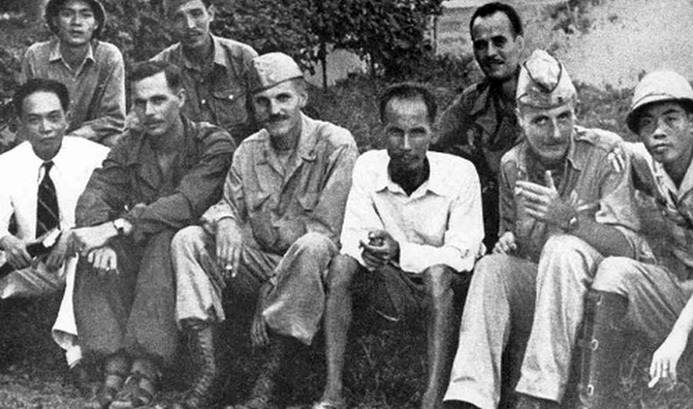 The Americans worked closely with Ho Chi Minh and the Viet Minh, who supplied the US military with information about Japanese troop numbers and movements. It was more a working relationship than an alliance, however, it gave Ho Chi Minh hope that Washington might later support Vietnamese independence, once the war had ended. By the start of 1945 the war was going poorly for Japan. Having surrendered the Philippines, the Japanese were in retreat across south-east Asia, relinquishing captured territory and incurring heavy losses. Tokyo had previously identified Vietnam as a fallback position for retreating Japanese troops, since it could be more easily occupied, secured and defended. In March 1945 the Japanese occupation force, claiming that French colonists were assisting the Allies, withdrew their support for the colonial regime. 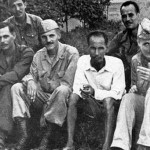 The French were removed from power in Vietnam; every French colonial official or military officer was arrested and locked up; all French soldiers were disarmed. Shutting down colonial authority in Indochina only benefited the Viet Minh, however, which flourished without pressure from French troops. The Japanese invited emperor Bao Dai to declare Vietnamese independence and handed him the reins of power, though both were only nominal. From March 1945 Vietnam became a member state of the Greater East Asia Co-Prosperity Sphere, in effect a Japanese colony run by a puppet government. Ho Chi Minh declared the Japanese the “number one enemy” but resisted calls for a major Viet Minh campaign against them. Knowing the Japanese were in retreat, and that a major Allied attack was imminent, Ho preferred to wait. By June 1945 he felt strong enough to establish a Viet Minh-controlled zone in north-western Vietnam. This region was remote and had no strategic significance to the Japanese, so they did not launch any major campaigns against it. Through the middle of 1945, the Viet Minh busied itself with organisation, propaganda and recruiting. Ho Chi Minh also had to deal with food shortages and famine, which were widespread in the north. The Viet Minh movement consolidated its hold in the north and began to spread into central Vietnam, gaining 100,000 new recruits. By the start of August 1945, the Japanese were on the verge of defeat and the resistance movement was stronger than ever. Viet Minh cadres began seizing control of Japanese-held villages and towns. In early August the US dropped atomic weapons on the Japanese cities of Hiroshima and Nagasaki, attacks that led to the Japanese surrender. Yet another foreign power had occupied Vietnam, only to be defeated. As the Japanese mobilised to leave Vietnam, its people wondered who their new rulers might be. 1. In September 1940 Vietnam was occupied by Japanese forces, which were expanding throughout south-east Asia and seeking greater control over China’s southern borders. 2. Japan’s vision was that Asian nations like Vietnam be absorbed into its Greater East Asia Co-Prosperity Sphere, a confederation free of Western influence or control. 3. 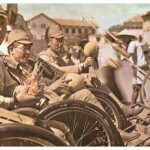 For much of World War II, the Japanese allowed the French colonial government to continue ruling Vietnam. Japan lacked the men for a full-scale occupation of Vietnam. 4. In March 1945 the Japanese, then in retreat from south-east Asia, abruptly ended French rule and seized control of Vietnam, installing Emperor Bao Dai as a puppet ruler. 5. With French control ended and the Japanese distracted, Ho Chi Minh and the nationalist Viet Minh flourished, gaining numbers and seizing control of parts of north-western Vietnam. Japan’s defeat in August 1945 then raised the question of who would rule post-war Vietnam. J. Llewellyn et al, “The Japanese occupation of Vietnam”, Alpha History, accessed [today’s date], https://alphahistory.com/vietnamwar/japanese-occupation-of-vietnam/.